Baby slings have come under fire lately and many have been recalled because of fear that they can cause an infant to suffocate. In addition, the government has declared slings to be dangerous, furthering causing panic amongst moms that swear by these types of baby carriers. Before you become alarmed and get rid of your sling, educate yourself on the type of slings that the recalls and negative press are referring to. Wearing your baby, as many refer to carrying your baby in a chest carrier or sling, creates a great bond between you and your baby and being misinformed shouldn’t discourage you from doing so. The slings that the government and Consumer Reports is referring to are known as “bag style” slings. Bag Style slings, such as the Sling Rider by Infantino, are the type that hang from the parent’s neck with a strap and cradle the baby in a curved fetal type of position. Carrying a baby in these slings causes the baby to be pressed up against the mother’s chest, posing a suffocation risk. Virtually any sling that supports a carry where the baby’s face is pressed up against the parent’s neck or up against the fabric of the sling, will pose a suffocation danger. 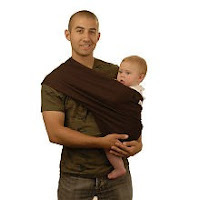 One of the slings I used and still sometimes use with my 18 month old is the Peanut Shell This is not a bag sling and is actually just a simple, compact carrier that you can fit into any purse or diaper bag. 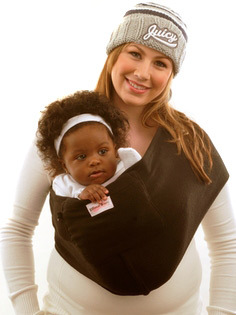 I had the black micro-fleece sling, made out of a soft, reversible material that’s ultra-comfortable for your baby. The black Peanut Shell was not exactly a girly color for my daughter but it was ideal because it could be worn both my husband and I. See Peanut Shell Reviews for more information on what others think. Hopefully the above will not frighten you and scare you away from slings and carriers all together. “Wearing your baby” in a sling or carrier not only helps solidify the bond between parents and their babies but it’s also convenient. As a new mom, I was overwhelmed with work, maintaining a household and caring for a new baby. Having the sling allowed me to carry my baby while doing things around the house without having to leave her unattended. There are many new gadgets marketed daily for moms and most are helpful in caring for baby. The key is educating yourself on the proper use and safety requirements. Remember that even the most popular, highly rated baby products are not safe if you aren’t educated and don’t know how to use it properly. Although many bag style slings have been studied and proven to cause suffocation even if worn correctly, the large companies that sell them have not recognized this. See Registered Nurse M’Liss Stelzer’s studies on baby duffels. She performed several informal tests with the major brands of bag style carriers that have been known to cause at least 3 infant deaths so far. Up to date, only the Infantino model has been recalled.